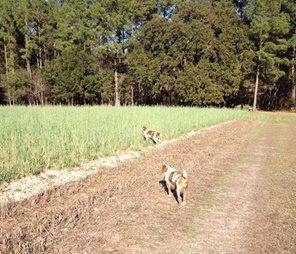 Herndon Company agents enjoy Quail Hunt at Herndon Farms in Lanier County. Brian Cooper, Jerry Hughes, Larry Mercer and Nathan Smith were the successful bidders for a Quail Hunt given by The Herndon Company in a recent auction at the Valdosta Board of REALTORS. The money raised is used for political activities for the protection of Private Property Rights for all Americans.